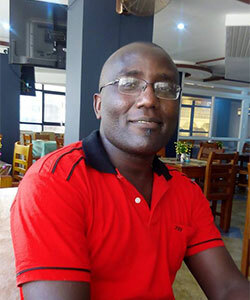 Holding a Bachelor of Science Degree from the University of Nairobi and Master’s Degree in Development Studies from St. Paul’s University, Amos Ahenda is an accomplished practitioner, researcher and trainer in peace work, with a special bias to ‘People & Organization- development in the context of change and conflict management. He has special experience working with conflict-prone people at the grassroots and in difficult environments through the tribune of conflict transformation, education and sustainable livelihood enhancement. Having served as an adjunct faculty at St. Paul’s University and Kisii University in the departments of organization and community development, he has written research papers and presented in international forums, including Transformative Education for Development- 1st Riara University International Conference on Education, Africa Peace Research and Education Association Conference (AFPREA) in Abuja, and Scramble for Africa Conference in South Africa. Two of his works have been published. He is currently working on a PhD proposal to the Institute of Development Studies at the University of Nairobi.